After his ship is wrecked, our hero Robinson Crusoe awakes to find himself on a desert island held in the grip of fear by the evil witchdoctor, Doomsday. Can the combined powers of fairies Good and Nuff help Crusoe rid the islanders of Doomsday’s tyranny? Or will the military mayhem that is Major Jump and Corporal Punishment save the day? What about the laundry owner Dame Widow Washday and her beautiful daughter Friday? And who is the mysterious Captain Cutthroat? This was thoroughly enjoyable and had something in it for all ages. Barry West was hilarious as Widow Washday, with wife Brenda playing one of his sidekicks Rainyday – complete with a kagool and umbrella hat. Children laughed out loud at the slapstick humour and the audience got to its feet for a round of the song “one finger one thumb” complete with actions. Corporal Punishment and Major Jump drilled all with their different training regimes and Alex Hawkins was great as the Washays’ worker Sunday. Atishoo, meanwhile, tickled the audience by uttering his catchphrase “no, that’s my name” and Fairy Good brought a sprinkle of magic to the evening with help from her trainee Fairy Nuff, who only had one wing. 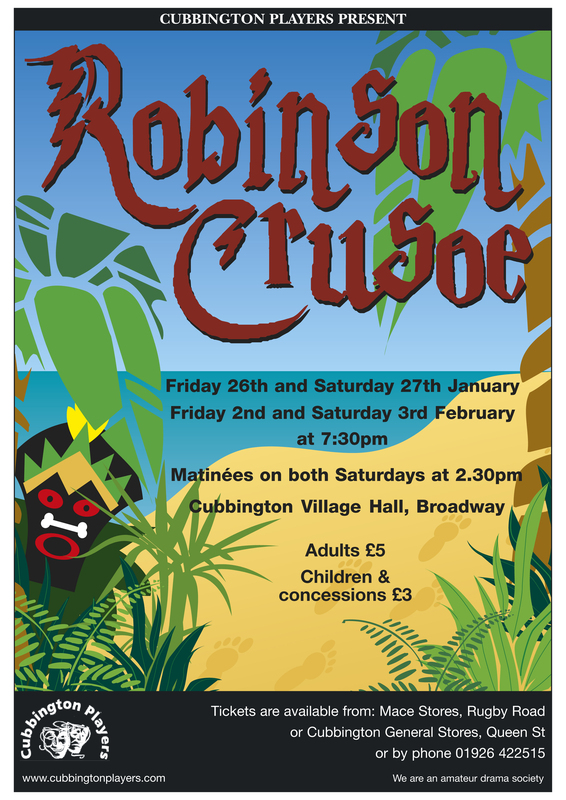 Robinson Crusoe was entertaining in his quest to conquer Doomsday, who was unbelievably nasty as the baddie of the panto. Plenty of family fun then, but the highlight for me was Mildred, a character who came on throughout the show as characters from other pantomimes in an attempt to gatecrash the pantomime and take on a lead role. An entertaining night, a traditional village panto and there was even free tea and coffee in the interval!